New products keep coming in, so I couldn’t keep the excitement to just one post! From a bunch more paint, brushes, and alcohol ink plus some really excellent local art, I think you are really going to like our new stuff, too! I am also excited to say all of the items in this article and the last 5 items post are available for purchase now. So no waiting to snag something you are eyeing. Your patience can now be rewarded - stop in and get creating now! This may seem like a super basic product, but this is a huge upgrade from the original line of acrylic paints Oracle was carrying. I always get super excited when we have the chance to bring even better products in to share with you! First off, these are a nice student grade paint. Don’t let the “student” label fool you though, Royal Talens really knows their stuff when it comes to making a paint products for artists. Other than a lower viscosity and a buttery texture, their student grade tends to be closely equivalent to the Liquitex Basics line. These standard series acrylic paints, as I mentioned, have a nice smooth texture, not too thick, not too thin, that can easily be mixed with mediums to manipulate that texture more to suit whatever your project needs. Also, the color range is huge! We now carry their full line of 90 colors, so if their is a certain color you are looking for, we can probably find it. Even if you are not in the market for acrylic paints, just come bask in all of the colors of this display! Speaking of a lot of colors, I have added 30 additional colors from Ranger to our alcohol ink selection! I have carried open stock alcohol inks pretty much from day one, but this addition makes our color range bigger than ever! The new colors plus the existing stock of Jacquard inks puts Oracle’s total colors up to 52! Plus, there is a variety of alcohol ink accessories too, including: storage, applicators, palettes, etc. Shell pink not the right shade? Need salmon instead? Ranger has a huge line of colors (77 colors), so it is just getting started. Be sure to let us know what colors you need and I will add it to the next expansion. Have you somehow missed what the heck alcohol ink is? I am here to help! In a short, they are super bright inks that kind of look like water color, but stick to non-porous surfaces like metal and plastic. They are super versatile and can work with a variety of projects as well as skill levels. I have a couple of reference books in the library for some project ideas to get you started. Also, keep an eye out for a demo day where we show you how to use Gel Press & alcohol inks, coming up very soon! So, when I say I am excited about this product…what I mean is I am more excited to see what you create using these. Teeny tiny detail work is definitely not for me, but I LOVE tiny art! These brushes are available in a variety of styles and tiny sizes. It is currently the largest line of miniature brushes on the market. These brushes also feature a really nice hardwood handle that has a good weight in the hand, offering great control in all of those tiny places. These brushes are recommended for acrylic & watercolor, but that shouldn’t discourage you from trying them on any project you need a tiny brush for. We have integrated a section into the store on the lost art of letter writing, that includes quill pens and wax seals. While Oracle use to carry them only at Christmas time, our customers really expressed a desire to have them available year round, so we did! While that was exciting all by itself, we added this kit for even more variety in our wax sealing section. A little background, here. We stumbled on Cognitive Surplus while we were at the NAMTA conference in San Antonio. NAMTA and CAMEX co-located (CAMEX being the conference for college bookstores, who knew?!) so we got to see some of the vendors that came for that conference, too. While walking through and endless selection of vendors selling hoodies with college football teams, we passed a beautiful display with notebooks covered in anatomical, biological, and other scientific drawings. I loved them instantly. Art and science really pair so nicely. While we haven’t added the notebooks to our product lines yet (we are getting the library reorganized to expand some more products… so it will happen soon…), we were excited to bring in these beautiful wax seals. Each kit comes with a metal seal with dark wood handle and two sticks of coordinating colored wax. Current designs we carry include the anatomical heart (pictured) with red wax, human brain also with red wax, earth with blue wax, the moon with solver wax, and honeybee with gold wax. The anatomical heart will be a great finishing touch to my annual Halloween cards this year. I am always excited when we find a local artist with a great product I can include in the store. Skyler of Unicorn Mullet makes lots of different gorgeous art pieces using a technique called millefiori. Basically, strips of clay are rolled together to make a pattern in a cane shape, slices are taken off of the cane to reveal the image. Sounds easy, but from experience I can say to get these beautiful sharp patterns Skyler gets takes a lot of work and practice. We are excited to carry these beautiful pens in the store. I have a variety of her designs currently up by the front counter, but if you can’t find one you like, more varieties can be found through her Facebook page by clicking here. She also makes adorable clay succulents that you will see in our art vending machine very soon! Ok, I lied about not having any Cognitive Surplus notebooks in stock yet. There was a limited quantity of their luminescent compositions notebooks, so I couldn’t wait! 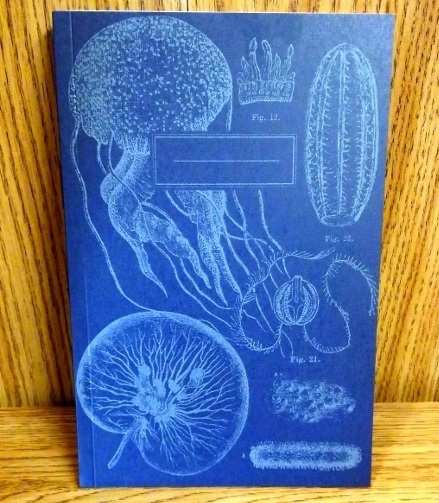 These notebooks have a screen printed glow-in-the-dark cover featuring a lovely Jellyfish design. Once more, this company is very environmentally minded so this notebook is made from 100% recycled materials. It also comes in a compostable “plastic” sleeve. If you are looking for a fun notebook, look no more! Thanks for reading, drop a comment and tell me what you are most excited about, and be sure to include pictures of your latest creations!